Looking back on the long-standing career of German vixen Doro Pesch, you’d have to say she’s done pretty well for herself. Apart from a little bit of a struggle through the mid to late nineties where she added a sort of industrial metal element (like most pre-existing bands had to do to survive the nineties), all of the other eras of her time in music have heralded some really great music. The four albums she did with WARLOCK are all classics in their own right, and their 1984 debut BURNING THE WITCHES is surely one of the most important female-fronted rock/metal albums of all time. In 2012, DORO is still going strong and the release of her latest album RAISE YOUR FIST shows that she has plenty more to offer. Doro is back to her best here with a great rock/metal hybrid sound that really suits here still amazing voice. Regular readers of this site may recall my general distain for female vocalists, I won’t get into that story again here, but let me say that DORO has always been one of the few exceptions and to hear her punching out this bunch of tunes is a great feeling. DORO adds a few more metal anthems to her repertoire with rippers like ROCK TILL DEATH, the speed-metal inspired TAKE NO PRISONER and REVENGE, the chant-filled GRAB THE BULL (LAST MAN STANDING) and also the perfect stadium ready title track RAISE YOUR FIST IN THE AIR. As per tradition to a DORO album there are a couple of tracks in which she revers to her native tongue with some German vocals, now I have no idea whatsoever what she is singing about on ENGEL, but it’s such a moody and brooding track that I can’t help but love it anyway. Also, as to be expected there are a couple of ballads to be found, and they are a couple of the most special moments of the album. IT STILL HURTS is a really, really good duet with MOTORHEAD’S Lemmy Kilmister. DORO’S melodic sultry voice mixed with the ever so slightly off-key and gruff sounding Lemmy just works perfectly. As some may know this isn’t the first time these two have worked together with classic ballads like LOVE ME FOREVER and ALONE AGAIN already firm in their places of heavy metal history. The other ballad, closing track HERO is a heartfelt tribute to none other than Ronnie James Dio, very fitting for the Queen of metal to pay tribute to the fallen King of metal isn’t it? I can’t see any reason whatsoever for DORO fans to not be excited about RASIE YOUR FIST. It includes everything you could ever want from a DORO album with a monstrous production, awesome classic era album art, a Lemmy guest-spot and a couple of German vocal tracks too. Anybody that thinks the current crop of rock and metal women are doing a good job should really listen to this album…DORO is a goddess and her new album is a very worthy beast indeed. you should definitely believe the hype. 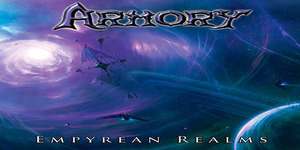 These guys, in my opinion, are one of the most exciting bands in the Power Metal scene right now, and EMPYREAN REALMS is easily the best album released in the genre this year.